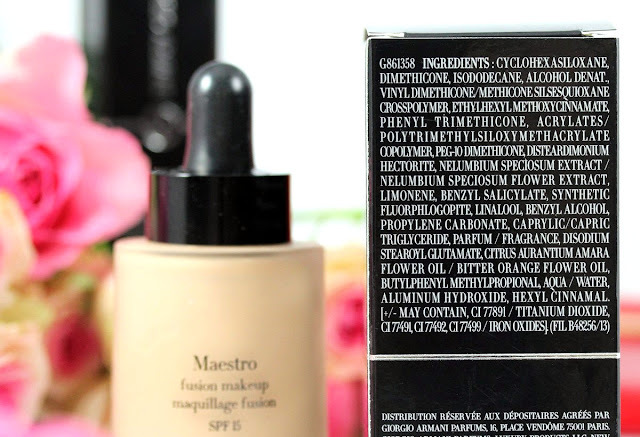 I'm quite picky when it comes to foundations and I must say that I absolutely adore this Maestro Fusion Makeup foundation! Let's find why below. 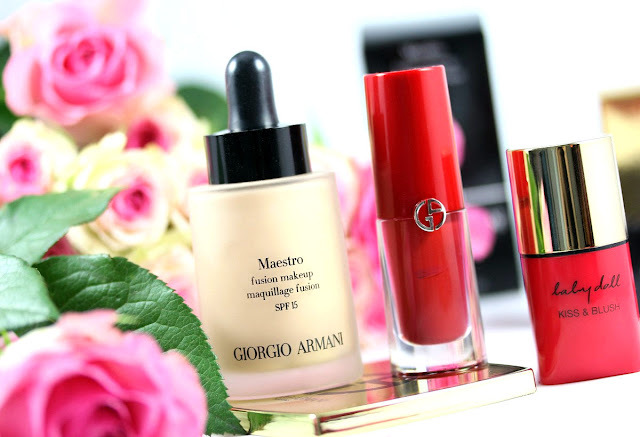 "A revolutionary oils and pigments fusion. A breakthrough in the way of blending and layering pigments to create a thin high-pigmented texture with a seamless velvet sensorial and matte finish. 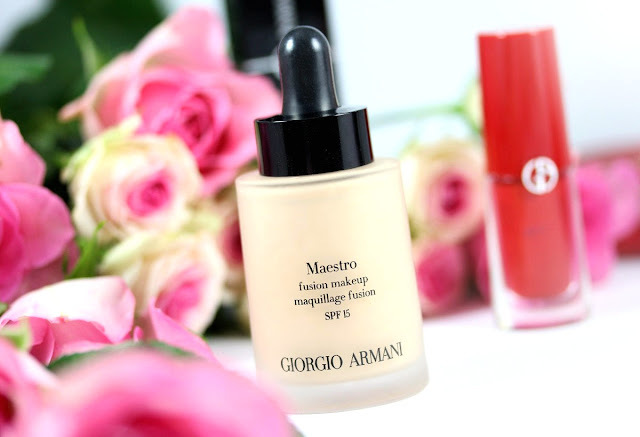 The no-makeup feel complexion perfector." It comes in a 30mL frosted glass dropper bottle. The bottle feels luxurious and sturdy but not too heavy. A dropper bottle can be a bit messier than a pump bottle but here the stopper is made in such a way that it's easy to keep the bottle clean. It's a rather liquid foundation that is easy to spread on the skin and is super quickly absored to give a gorgeous velvety finish. It actually feels velvety when you touch it but there is still a little bit of glow. So for me, it's in between matte and glowy. We could describe it as velvelty with a luminous finish. Because of its thin texture, it melts into the skin and I really have the impression I'm not wearing any makeup. I can't feel it and you can't see any residues on the skin. It's perfect for the no-makeup look that I usually go for. To apply it, I use 2-3 drops. I applied them on the back of hand, dip my finger in it and apply dots all over my face. Then I blend everything with a beauty blender. 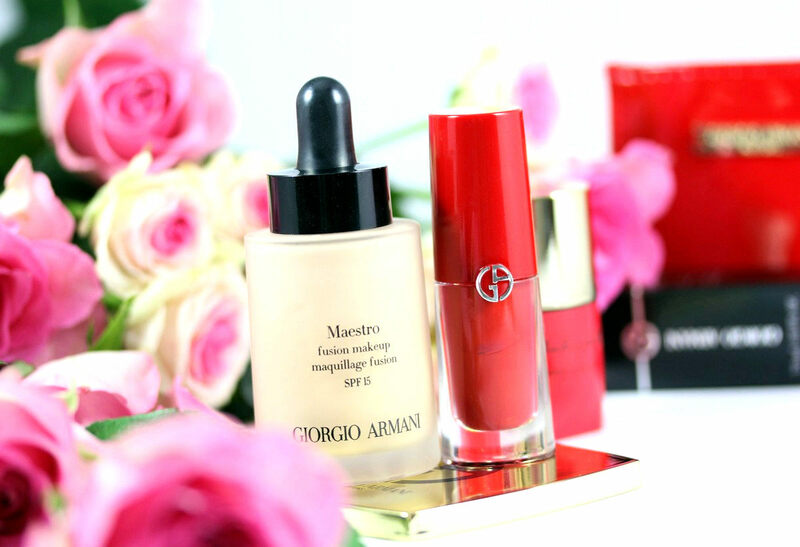 According to Georgio Armani, coverage is sheer but for me it's more a medium coverage. It does cover the redness that I tend to have on my cheeks and a few imperfections that I may have. 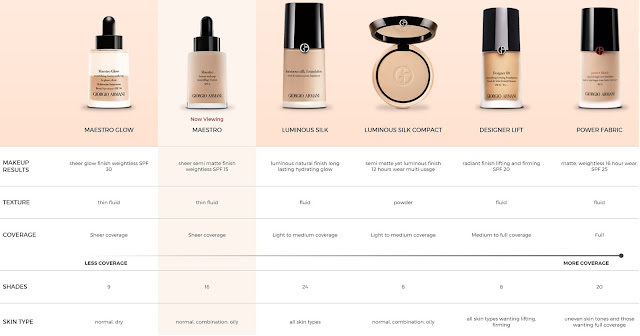 Maybe I think it has a medium coverage because I always wear sheer to medium coverage foundations so that's probably why I'm biased. 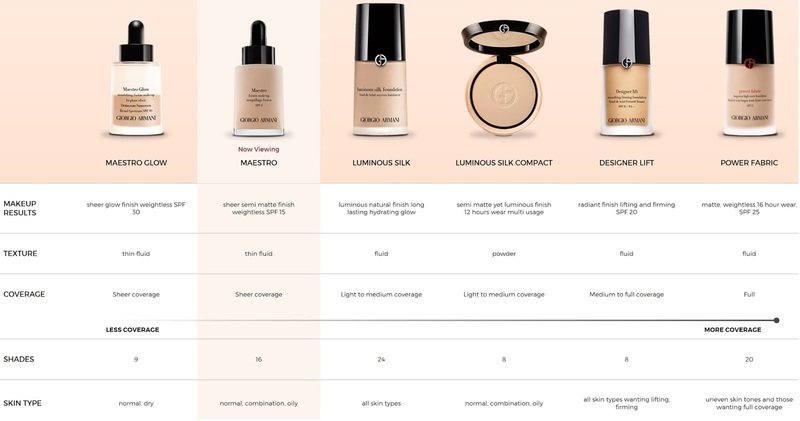 On me it lasts all day (I have normal skin) and I only powder on my nose and cheeks where my frames touch my skin :p I didn't notice that it oxidizes throughout the day nor does it emphasizes dry patches or pores. 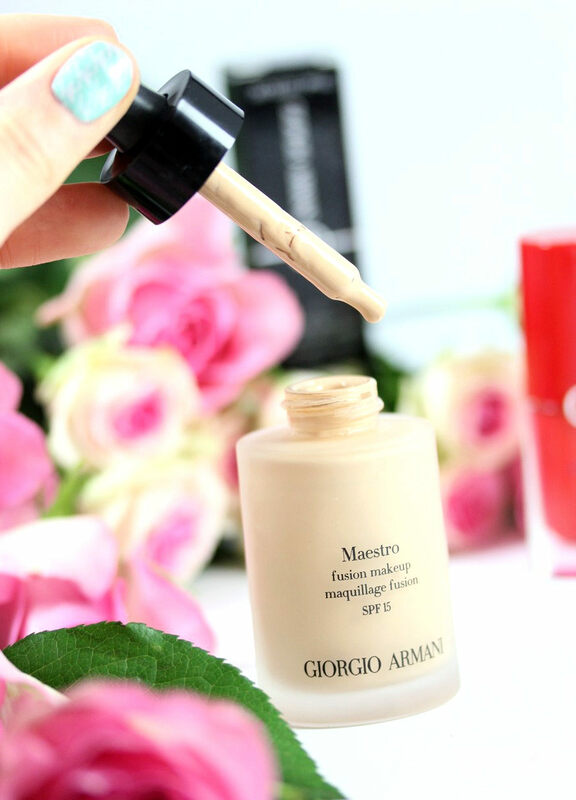 For me, it's one of the best foundations I've ever tried (my skin: normal skin type with only minor skin imperfections like redness on my cheek). 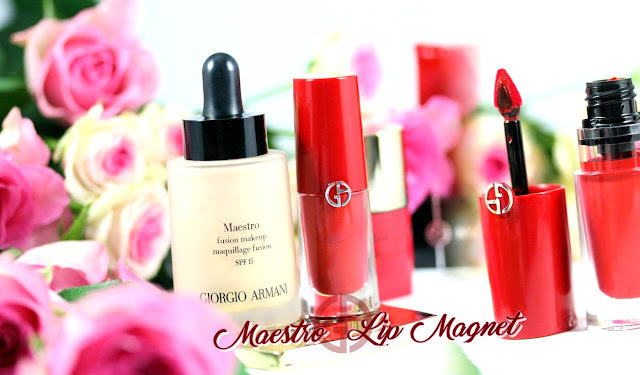 "An extremely fine texture, unparalleled sensation of weightlessness, intense color concentration, ultra-chic matte finish and flawless, long-lasting wear: Lip Manget is all this and more. 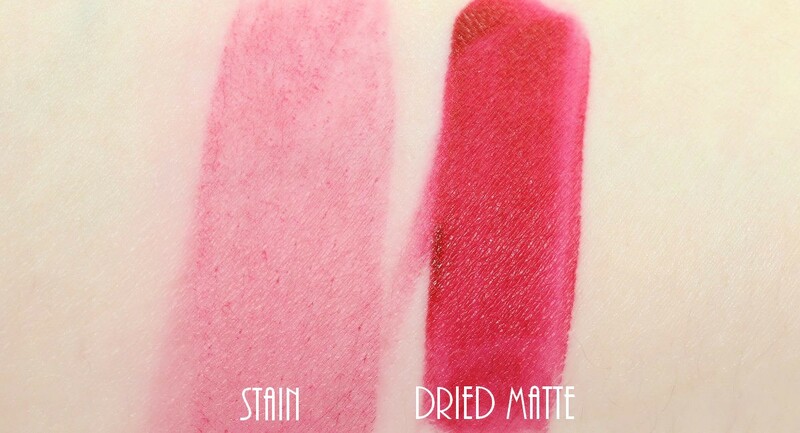 This long-lasting (up to 8 hours) matte lipcolor is never greasy or sticky; it does not migrate or dry your lips. 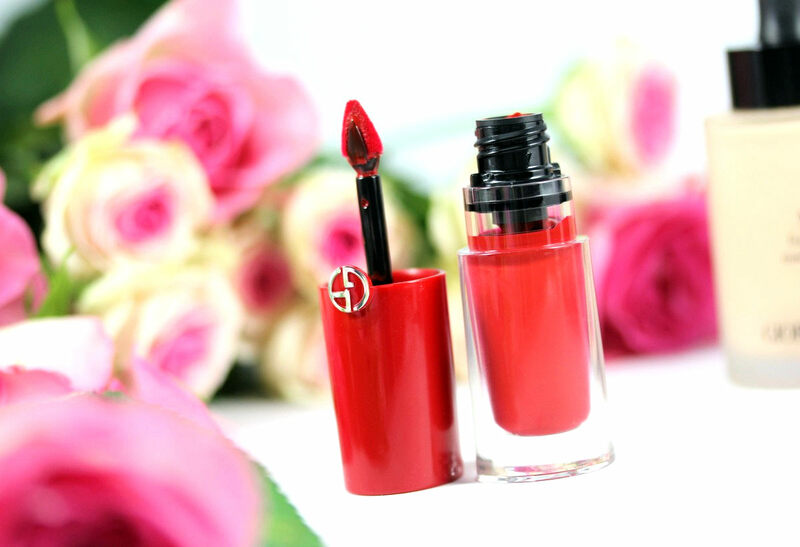 Lips stay hydrated and perfectly defined for hours on end, with a very pleasant bare-lips sensation." OK, I have to agree with every claim! 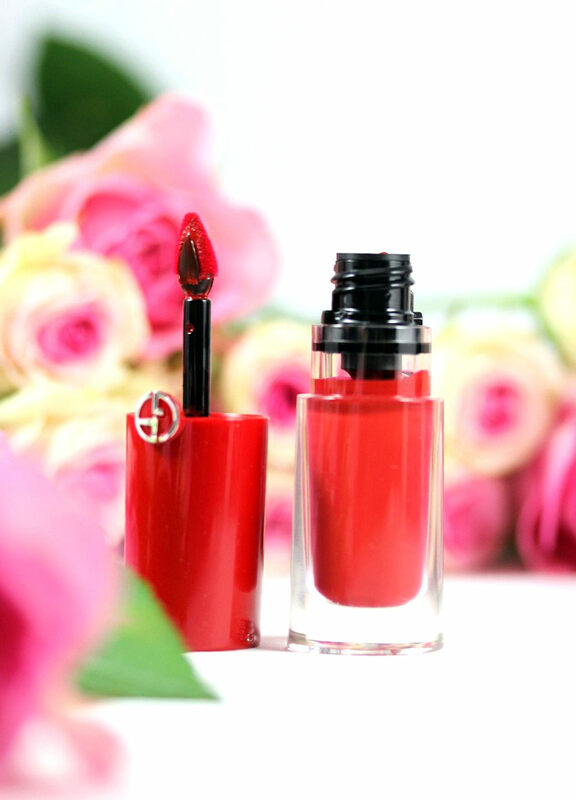 It feels weightless, the color is intense, it dries down to a matte finish and it lasts forever (at least the color I have 401 Scarlatto). 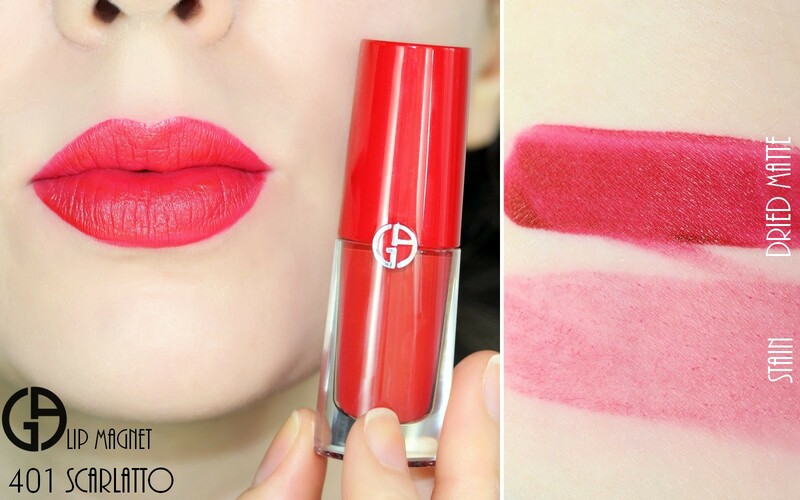 It actually leaves a stain on your lips, this makes the lip color lasts longer and also it helps to fade the color evenly. I didn't experience any crusting, flaking or any other ugly things that can sometimes happen with lipsticks. Importantly, it doesn't dry the lips although it dries to a matte finish. It's not moisturizing either. It really feels as your not wearing anything on your lips so I totally agree with the second skin claim. That's probably also due to the super thin texture. It does transfer a bit during about the first 3-4 hours and then this is minimal (although still not 100% transfer proof). 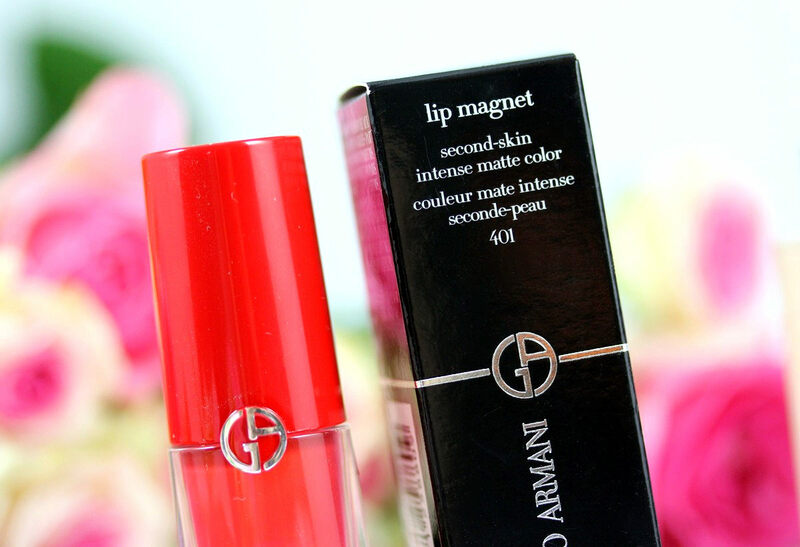 I've been thinking about it a long but yes, I have to say that this lip magnet has officially entered my top 5 of favorite lip products! I just love it! 401 Scarlatto is a red with pink undertones. Armani products can be purchased from your regular Armani counter (e.g., Sephora, Selfridges, Nordstrom). In Switzerland you can find them at Manor and Globus. Wonderful post dear! Such lovely photos! I love the sound of that foundation! Thank you so much! Happy to hear you like it! 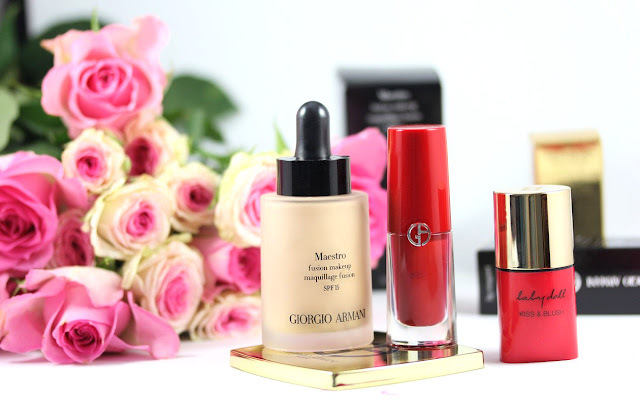 I love the photos - you captured the essence and luxury of Armani beautifully! 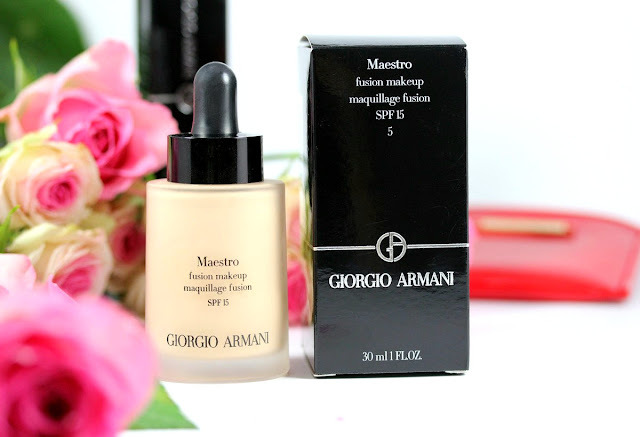 I have tried samples of a couple of Armani foundations and found that they don't match my skintone unfortunately (they oxidise and make me look too ashy). 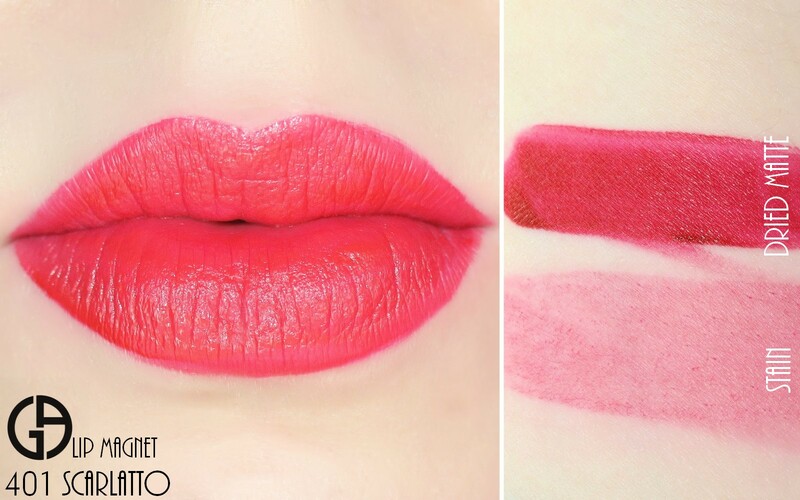 I definitely want to try the lip magnet fusion! Looks soooo goood! Thank you so much, dear! I'm so happy that you like my pictures and review <3 Finding your correct shade in foundation is not always easy. I can highly recommend the lip magnets, they're awesome! Thank you, my dear! I also love the stain! 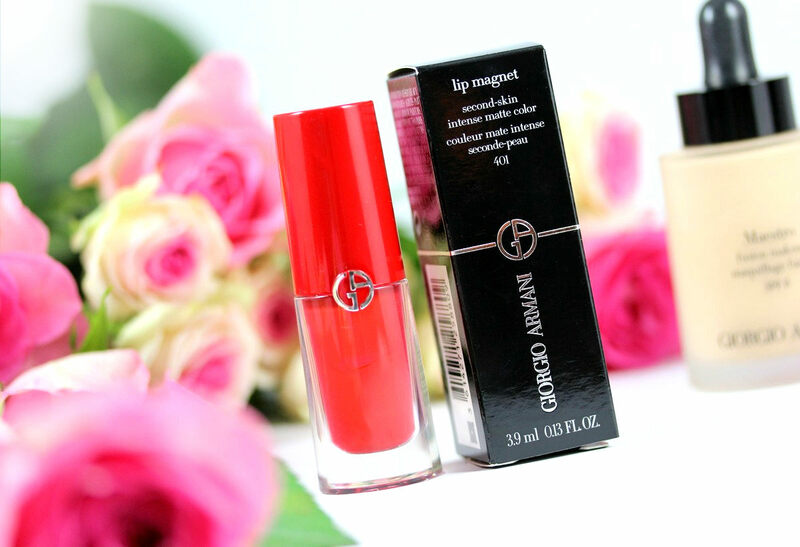 It kind of remain me of some korean lip tints, with a high pigmentation! Ca y est ! J'arrive enfin à recommenter mais seulement depuis mon PC ! Très jolies photos qui me donnent envie d'essayer cette marque ! Argh ! De futures dépenses ! Ca ne s'arrête jamais lol ! haha oui c'est terrible, il y a toujours des nouveautés bien trop tentantes!